So far today I've spent most of the morning talking. 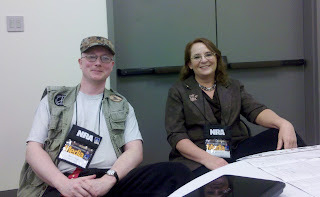 Showing up early I got into a discussion of SHOT show blogger vetting, old and new media, etc w/ Kathy Jackson from Concealed Carry Magazine. Following that, Jay G. and I got into a discussion w. Stephanie Sanford, NRA Media Liason over interactions w/ the blogging community. It was a very pleasant discussion where we discussed how we hoped to continue the positive relationship that has developed over the years. Hit the floor and went back over to the ATI booth to oogle the STG-44 replica to ask a few questions. Mentioned the fact that there's been issues w/ feeding on some of their replicas. 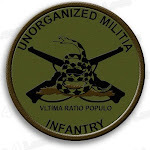 They stated that's usually due to using standard velocity ammo when they require high velocity. Got some more details as well. 25 rnd magazine w/ extra mags at $40 ea. Swung back around and ran into ISRA Pres. Don Moran talking to Alan Gottlieb of the SAF. They both enjoyed the story of the little protest that couldn't. At the ISRA booth, they told me they had signed up dozens of new/renewed members along w/ nearly a half-dozen life members. Said goodbye to numerous folks including bloggers and NRA staff and headed out. But not yet 'quite' for home. After 6 years of talking online and working together to backhand the anti's, I finally got to meet one of my best online friends, 45Superman. We got together for a couple drinks (mine non-alc., I was driving) at his favorite pub. And then it was back home. Tomorrow I'll clean up the posts for easy linkage and post my final thoughts including all the bloggers I met, saw again, etc. I still say the old/new schism is a falsity in and of itself: we is them and they is us. Media is media, no matter what the venue or outlet. Anyone (on either side of that line!) who sneers at the other side is being very foolish, because if you have anything worthwhile to say and if you're any good at saying it well, as time goes on you'll have an opportunity to say it in their preferred venues as well as in your own. Prolific producers always end up using multiple outlets over time, even though most settle on one preferred outlet for most of their work. I'm not a radio person, but I've been on the radio; would it do my message any good if I refused to do radio because it's a different venue than a podcast? I'm not a podcaster, but I've been on podcasts and deeply enjoy doing them; would it do my message any good if I refused podcast interviews because they aren't "real radio"? The venue does not matter. The message does. Of course I say that as someone with one foot firmly on each side of the Great Divide, but it's still true. A decade from now everyone is going to look back at this stupid squabble and go, "What in the world was that all about?" How Does It Feel, Ladd?